In about five seconds, LeBron James pissed off 29 cities (Nearly bringing the apocalypse to Cleveland) and coined the phrase "Taking my talents to…" It is a preface that every Blue Chip college football/basketball player now uses when they commit to a program. It was a decision so Earth moving that ESPN gave it a damn hour special, a ridiculous idea considering we all tuned in to hear one sentence. But LeBron was a special, once in a generation type of player, so we allowed him to grab the spotlight and hold it as long as he pleased. 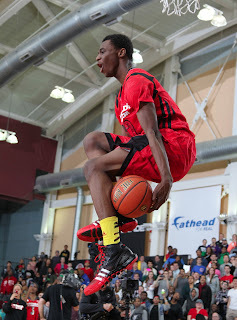 Andrew Wiggins is a little bit different. Widely considered the greatest high school basketball prospect since LeBron came out in 2003, the 6-foot-7 forward will make his "Decision" tomorrow around noon at Huntington Prep in West Virginia. Will there be an hour-long special, as coaches John Calipari, Roy Williams, Bill Self and the rest of the college basketball world wait on baited breath? Nope. Wiggins is set to sign, and the only media member allowed to be in attendance will be a reporter from the Huntington Herald-Dispatch. Dang, talk about being in the right job for a huge scoop. "Andrew will sign Tuesday at around 12:15," Huntington head coach Rob Fulford said in a statement. "He's does not want to have a press conference signing. He wants it private to just his classmates, family and friends." Doesn't this just seem wrong? Wiggins has been a celebrity since his 8th grade highlight reel hit YouTube in early 2010, and this decision will change the landscape of college basketball, if only for one season. Shouldn't we get a little bit of a spectacle? Wiggins is set to choose between Kentucky, North Carolina, Kansas and Florida State, so don't you kind of want to see him picking up the ball caps from those schools and jokingly decide which one he will attend? Don't we all love when 18-year olds literally hold the futures of proud institutions in their hands? Well, unfortunately, we're not going to get any of that. But, here is a breakdown of the four schools Wiggins is eyeing, and why him going to each of them would be freaking awesome. Kentucky: The Wildcats are already bringing in arguably the best freshman class in history with a record six McDonald's All Americans, and five of Rivals.com's top-11 prospects. That's pretty absurd, and Kentucky is also returning several high-profile sophomores from last season's team that was derailed by the injury of Nerlens Noel. If Wiggins ends up in Lexington, forget the Fab Five, the Wildcats would have SEVEN of the nation's top-20 incoming freshman, and two "leftover" five-star prospects from 2013. Just seeing that much young talent in the same place would be a ton of fun, and Wiggins should have plenty of space to work for his highlight-reel dunks. Kansas: We talk about the constant youth of Kentucky, but Kansas won't exactly be experienced next year. With Ben McLemore headed to the draft after his freshman year and Jeff Withey leaving after a fine four-year career, the Jayhawks are suddenly leaning on Naadir Tharpe and a dude named Perry Ellis. Yeah, Perry Ellis. I have to say, this is probably the one place I hope Wiggins doesn't end up. Bill Self is a fine coach, and Kansas wins the Big 12 every year, but if you're looking for intrigue, there are sexier destinations. Still, Wiggins putting the storied Kansas program on his back and carrying them to a Big 12 title against what should be a loaded Oklahoma State team would be fun to watch. North Carolina: People forget, but Roy Williams' teams are really fun to watch when he has the right pieces in place. The Tar Heels have underachieved in recent years, mostly because star recruits PJ Hairston and James Michael McAdoo only turned out to be "pretty good." With highly regarded power forward Isaiah Hicks staying home in North Carolina, the Tar Heels have a chance to bring in the best pair of freshman forwards in the country. Plus, wouldn't the best recruit in a generation look great in that powder blue? Florida State: In our podcast yesterday, my colleague Jeremy Conlin basically said that he loved when star recruits go to "under the radar schools" and Florida State would certainly fit the bill for Wiggins. It would give him the chance to totally put a team on his back, in a soon-to-be brutal ACC, and show us all what he's capable of. His father Mitchell Wiggins was a first round NBA Draft pick out of Florida State in 1983, and helped lead the Houston Rockets to the NBA Finals in '86. His mother Marita Payne-Wiggins is also a former Seminole, winning four national track championships at Florida State before going on to to win a pair of Silver Medals at the 1984 Olympic Games. Athleticism is certainly in his blood, but is an affinity for Tallahassee?